At the age of 50, just after sending the youngest of my 3 beautiful daughters off to live in Israel for a year, I went for my annual mammogram. I received a phone call on a Friday afternoon explaining that I needed to come back for some additional images. The follow up was scheduled for Monday. After a long weekend I returned to the office where I repeated the mammogram. It was then explained after further views that I needed to schedule a needle biopsy. The idea of someone putting a needle into my breast didn’t sound like something I would want to do, but the choice had been taken away from me so I did as was recommended. A few days later I received a phone call from my doctor explaining that I did in fact have breast cancer. As my journey unfolded I made an appointment with a surgeon. After further testing it was determined that there were probably in fact two confirmed spots of cancer in the left breast. I was also tested for the BRCA 1 and BRCA 2 genes. I was negative for both. The surgeon then explained to me that he could do a double lumpectomy but he wanted me to see a plastic surgeon about my options after the cancer removal before we did the surgery. I went to see a wonderful oncologist and plastic surgeon that specialized in reconstruction of the breast after mastectomy. This plastic surgeon explained to me the “tram reconstruction surgery”. It sounded pretty good except for the part where they take muscle from the abdomen, which may result in chronic lower back issues. The oncologist however came into my room with a surprising suggestion. He recommended that I undergo a bilateral mastectomy even though there was no evidence of cancer in the right breast. He felt that considering my age and family history this was a safer approach. I must admit that this was the point when it all seemed too overwhelming. As I was working on absorbing what was happening to me my dad made one final suggestion, which changed my life forever. He knew an oncologist at UCLA named Dr. Richard Pietras. His specialty was breast cancer and he was not only a practicing oncologist but also a breast cancer researcher. My dad suggested that I talk to him on the phone about my case. I did so and he introduced me to Dr. Helena Chang at the Revlon/UCLA Breast Center. My husband and I went to meet with her shortly thereafter. We waited in a room while she reviewed my imaging results. She walked into my room, put some film up on a screen and pointed one, two perhaps three spots of cancer in the left breast. She agreed that a bilateral mastectomy was the right path and wanted me to meet with Dr. James Watson to discuss my options for reconstruction. After meeting with Dr. Watson I was done! He was amazing! I had a very good chance of being able to have a similar version of the tram reconstruction and with less muscle removal from the abdomen! I contacted Dr. Chang and asked her to schedule the surgery. It would be approximately 10 hours with 2 separate surgical teams! I was actually pretty excited! I would be cancer free, have a breast reduction and a tummy tuck all in one day!! Everything was scheduled and surgery was done on December 3, 2005! After recuperating from the surgery for a bit (by the way the results were and continue to be absolutely amazing) I went to see Dr. Pietras who agreed to become my oncologist. He explained to us about a new state of the art test called the “Oncotype Test”. He explained that the test would rank the chance of recurrence of my cancer on a scale of 1 to 100. You wanted to score as close to 1 as possible. My result was a 1!! We were all overjoyed with the results. No lymph node involvement, stage 1 breast cancer, 2 confirmed spots of cancer removed. Since I had not entered into menopause, it was suggested that I undergo five years of Tamoxifen. It was also standard of care at that time not to continue with mammograms as after a bilateral mastectomy almost all of the breast tissue had been removed. It was my choice to continue with mammograms or not. I decided to take the Tamoxifen and to continue with the mammograms. In December 2005 I had my routine mammogram and then a final short surgery to conclude the reconstruction process. While home recovering from the final surgical procedure I received a phone call from radiology at UCLA. Please come back for some additional views. I went back for a second mammogram and they explained to me that they saw something different on this mammogram but thought I could wait a few months and repeat the test again. My family thought there was no need to wait and worry so I made an appointment with Dr. Chang to review the results. She said it could be nothing but why bother waiting for a few months when we could simply do the needle biopsy and know for sure if it was something or nothing. Sounded good to me so we went ahead with the procedure. I can’t honestly say I was shocked the first time I was diagnosed with breast cancer with my family history but the next phone call absolutely shocked me to the core!! It was back. The same identical hormone receptor positive breast cancer was back in the same left breast! Dr. Chang explained that she would do a lumpectomy this time but we needed to run a PET scan before doing the surgery. My next surprise was the PET scan showed a suspicious spot on my left iliac bone. This also needed to be biopsied. After that test the results came back that in fact it was the identical hormone receptor positive breast cancer in my left iliac bone. Additionally, I had still not concluded menopause and my type of cancer was fed by these hormones. Decisions were made rapidly. First surgery was a lumpectomy. A week later second surgery was an Oophorectomy. After recovery my new oncologist Dr. Sara Hurvitz took over my case. This was my formal introduction to Stage 4-breast cancer. I was positive that although I had eluded the radiation and chemotherapy the first time I was diagnosed this time I was not going to be so lucky! Dr. Hurvitz explained to me about this phase 1 clinical trial that I might be eligible for if I did not have radiation or chemotherapy. She gave me the materials to read over and recommended that I schedule a consultation with a radiation oncologist to discuss my options. After meeting with the radiation oncologist it was concluded that I could afford to put off any radiation at that time and that if I needed it in the future not only would it still be available to me but I could just drop out of the clinical trial and get whatever treatment I needed should there be a recurrence. Decision made. Join the Pfizer phase 1 clinical trial for PD-0332991. May 2005 was the beginning of a new chapter of my life. I began taking Letrozole in conjunction with PD-0332991. I received CT scans every 12 weeks and Bone Scans every 16 weeks. I also received XGEVA infusions to respond to the spot on the iliac bone. Happily throughout the remainder of 2005 things were kept “STABLE”. This became my new favorite word!! Then suddenly in January 2006 I completed my normal scans and received some amazing news!! No evidence of cancer anywhere in my body!! 9 months on the Pfizer phase 1 clinical trial and they couldn’t find my stage 4-breast cancer!!!!!!!!!! Fast forward to October 2016! 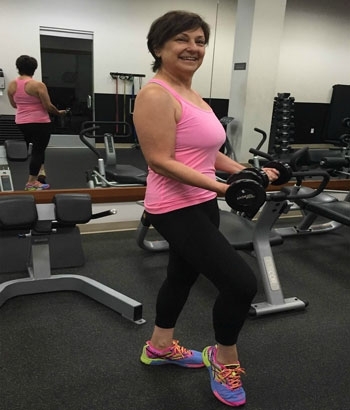 Nearly 6 ½ years after my stage 4-breast cancer diagnosis my cancer is missing!! In these past 6 ½ years I have had many laughs, many miles of traveling, enjoyed beautiful music, loved my family and been loved by my family. All of this I owe to UCLA and Pfizer!